The old saying, “Out of sight, out of mind,” is a big reason why so many of us have ignored the accelerating problem of e-waste. That’s because until recently, we have been able to sweep it out of sight, not under the rug, but over to China and developing countries that are out of sight for most of us. We at Exit Technologies strongly believe in reusing and recycling e-waste. Consumers of computer based technology have significantly benefited from what is popularly known as Moore’s Law, the principle that microchips double in capacity every two years. By putting more processing power in the hands of consumers, Moore’s Law has transformed the landscape of human potential for decades now. Unfortunately, it has also altered the earth’s landscape as well in the form of e-waste that is strewed across the earth. While the digital revolution perpetuates innovation and productivity, it also propagates uncontrolled obsolesce as well. Some argue that built-in obsolescence is part of the business plan today for digital device manufacturers. In the same way that companies are completing the digital transformation of their organizations, consumers are doing the same in their personal lives. As mobile technology has vastly increased the mobility and agility of everyday people, the massive waste remains of plastic, metal and lead leave a stationary scar where they are collected and dumped. While our computer devices have grown smaller over the years, the daunting mountains of e-waste grow larger. How many computers do you think there are today? According to Gartner, the billionth PC was shipped in April of 2002. The next billion number milestone was achieved just five years later. Worldwide shipments of PCs, tablets and mobile phones totaled 2.28 billion units in 2017. These aren’t just small mobile devices either as worldwide shipments of traditional PCs totaled 60.4 million units in the first quarter of 2018. You can view a live Quarterly PC tracker that gathers PC market data from 55 countries across the world. For as many computer devices that do exist, there are even more than 4 billion Internet users in the world today, which means that there are still billions of potential purchasers of new computer devices. The world doesn’t only have a human population problem. The exponential multiplier in computer devices is having substantial impact on the world today. The old saying, “Out of sight, out of mind,” is a big reason why so many of us have ignored the accelerating problem of e-waste. That’s because until recently, we have been able to sweep it out of sight, not under the rug, but over to China and developing countries that are out of sight for most of us. For more than two decades, countries such as China have served as the world’s giant recycling bin. In 2016, China processed at least half of the world’s exports of waste plastic, paper and metals. The US alone exported 16 million tons of waste to China that year. It was a great arrangement for many nations in the western world. Something happens however when a country such as China develops a high standard of living for its citizenry and grows more influential in the world – it no longer wants to deal with someone else’s waste. In July of 2017, China’s Ministry of Environmental Protection announced to the World Trade Organization that it would no longer import 24 common types of solid waste that it once allowed due to contamination concerns. Ten months later, it increased the size of the ban to include another 32 types of other solid wastes as well. Undoubtedly, the Chinese will broaden their restrictions as time goes on. They do not want our waste, and we certainly cannot blame them. So where is it all going to go? According to a report by the United Nations, global e-waste output will reach 50 million metric tons in 2018. It is easy to dump e-waste overseas. Disposing of it safely is far more difficult. The term e-waste may not sound threatening; but, it is made up of deadly compounds such as lead, mercury and cadmium. Numerous studies have found a strong correlation between human exposure to these heavy metals and volatile organic compounds and the prevalence of different cancers, birth defects and other genetic risks. When e-waste is sent off to third world countries, these vast collections of electronic waste depend on cheap labor to break down the scrap. Unfortunately, these workers do not have the necessary protection to safeguard them from exposure to these carcinogenic compounds. Even worse, these toxic materials eventually infiltrate the soil, groundwater and waterways, making them unsafe to use for drinking and agriculture and affecting animal life as well. Incinerating these materials simply exposes their poisons into the atmosphere. E-waste is unsightly and harmful, yet the world continues to negate the critical necessity to recycle these compounds. 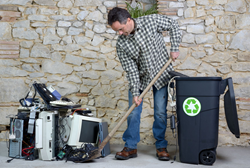 According to the EPA, only about 40 percent of consumer electronics were recycled in 2013. This means that the majority continues to end up in landfills or shipped to developing countries. While computer performance and processing capabilities continue to increase year after year, the tasks that many users partake in do not necessitate the perpetual turnover of hardware. Normal computer tasks such as checking email, word processing, internet browsing and media streaming do not demand resource-heavy machines. Many users don’t need the latest and greatest, just a simple computing device that gets the job done. Many organizations will gladly accept donated computers to then distribute to others. Recycling older equipment to allocate to users that can accommodate less robust devices is just one step that can be taken to help decelerate the proliferation of new devices. Recycling doesn’t necessarily mean settling for older machines. The devices that consumers are so willing to toss in the trash can serve as renewable resources that are then used to create the devices of tomorrow. Apple Computer has their own recycling facilities to facilitate the disposal of discarded devices and computer components. An example of their recycling efforts is their newest disassembly robot named Daisy which can take apart up to 200 iPhone devices an hour, sorting the removed components in the process. Apple’s own goal is to one-day extract nothing from the earth. Other computer vendors are taking back their products as well. A growing number of companies are recognizing the need for e-waste recycling services, giving consumers and organizations the ability to be stewards of the environment. When seeking an e-waste recycling service provider, it is important to ensure that you find one that is responsible and uses certified R2 standards. These firms will purchase working equipment that still have value from consumers directly and remarket them through established relationships and connections. When this isn’t possible, they have the experience to responsibly recycle these materials in a safe manner. At Exit Technologies they are certified and professional service provider for a data center liquidation or decommission. If you need to recycle bulk computer parts or have bulk memory then Exit is the premier asset liquidation company. The concern for the environment is more evident every day. Many government bodies across the country have begun banning plastic straws for instance. While efforts such as these are commendable, the need to combat the issue of e-waste is far more pertinent. It is undeniable that the world will only increase its digital endeavors and because of this, the need to recycle our e-waste becomes increasingly critical. Saving the world and possibly making a few bucks in the process. Who can say no to that? If you or your company has computer components in bulk visit ExitTechnologies.com or needs IT equipment valuated by trained professionals, please visit Asset Liquidation or our Data Center Decommissioning page for more information.